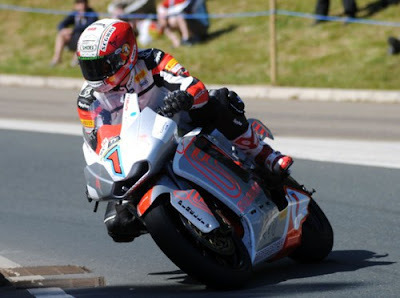 Mike Rutter, MotoCzysz, breaks the Ton at the 2012 TT-ZERO electric motorcycle race on the Isle of Man. Team mate Mark Miller and John McGuiness, riding for Mugen Shinden, also broke the Ton, with Rutter turning in the fastest time of 21:45.33 mins at an average speed of 104.056 miles/hr. The race started at 3:40 PM today local time after several rain delays. Riders interviewed by Manx Radio were worried about track conditions, and IOM TT officials issued an official warning of damp patches and possible reduced visibility around the track. Nervous riders aside, the race went off and the teams did very well with three teams breaking the 100 miles/hr lap speed goal. At the same time several teams either did not even make it to the start line, or retired part way into the race. The Isle of Man Mountain Course is a tough test of men and machines. The race was all about Rutter, Miller and McGuiness duking it out for the podium as well as the prize for besting the 100 miles/hr lap speed. All three achieved increasing lap speed, reaching nearly 120 miles/hr indicated lap speed, that is until they reached the mountain portion of the course. At the Sulby speed trap the three were a bit slower, in the 120-130 miles/hr range, than Rutters 154 miles/hr speed he set during practice on Saturday. It was reported at that time that Rutter's power was pretty well drained by that practice lap, so clearly the strategy had to be to tone it down a bit for the actual race. A surprise came at the Bungalow timing point when the transponder system indicated McGuiness reached that timing point first. Did that mean Rutter and Miller had bowed out of the race on the mountain? Nope, both showed up again at the Cronk ny Mona timing point, so the transponder system simply missed registering them. Of the other riders, only Rob Barber managed to finish the race. He turned in a 78 miles/hr lap speed. Of the 9 teams starting the race, only four finished. Clearly there are two ideas to take from that: 1) the Mountain Course is very tough, 2) the electric bikes still need some testing and refinement. For example the Ecotricity bike, the Ion Horse, ridden by George Spence, had trouble at the starting line with starting, then got underway, but by St. Ninians the bike developed some trouble, with Spence pulling over to the side of the road and then eventually retiring. Antonio Maeso, riding for Tork India, retired even earlier. Yoshinari Matsushita of KomattiMirai Racing made it to at least the Ramsey timing point before retiring. I don't have a complete list of teams who were on the Island but didn't even make it to the starting line. One was Lightning Motorcycles whose rider, John Burrows, was down at the start line and got interviewed by Manx Radio. He felt completely let down by that team, complaining that the bike didn't make it to practice and now didn't make it to the start line, even after he had flown to California for testing the bike. Having seen the Lightning team at a dozen or so races, I'm sure that Hatfield and everyone he had on hand had busted their butts trying to get ready, but what counts is the results of the race.